Reinstated as the Hand, Ned sits for the King while Robert is on a hunt, and issues a decree that could have long-term consequences throughout the Seven Kingdoms. 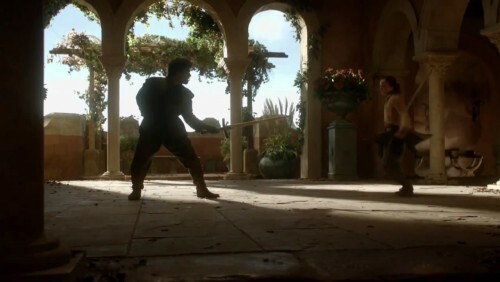 At the Eyrie, Tyrion confesses to his “crimes,” and demands that Lysa give him a trial by combat. Joffrey (Jack Gleeson) apologizes to Sansa; Viserys receives his final payment for Daenerys from Drogo (Jason Momoa). With last week’s episode, the cost of playing the Game of Thrones became brutally clear to Ned. But honourable and stubborn as he is, he does not veer from the path he’s set upon on in this week’s episode either. In the King’s absence, Ned is forced to deal with the fallout of Catelyn’s actions as the Lannisters once again show that they are not shy about letting a third party pay the prize. Robert, meanwhile, has headed out on a hunt. Sadly, like the tourney, its size leaves a fair bit to be desired, though it does provide the opportunity to give some more insight into Renly’s motivations. In King’s Landing, we also get to see Arya with her “dancing master” again and she learns a valuable lesson. Maisie and Miltos are, once again, fabulous together. Alas, no one is around to teach Sansa any much needed lessons; Septa Mordane isn’t quite what she needs right now. Especially not as she is visited by Prince Joffrey in a scene that could perhaps have used a little more setup, though we can definitely see what it is setting up for. High up in the Eyrie, Tyrion finds himself teaching Abstract Concepts 101 to the gaoler Mord, who proves to be something of a challenging student. But eventually he does get himself out of the cell and into another predicament as he calls for a trial by combat. The outcome of that situation should definitely live up to most expectations. However, for us the highlights of this overall very good episode are definitely the scenes in Vaes Dothrak. And while a lot of it has to do with Dany taking yet another giant step towards a more powerful, independent self, it is Harry Lloyd’s Viserys who really shines. He has a fabulous scene with Jorah following on Dany’s big moment where he really captures what George says about how each character should be written as the hero of their own story. The final scene of the episode is one of the best conclusions so far, especially when it comes to the acting.